Each year, as part of my spiritual practice, I take time to go into seclusion. When I tell people I’m going, some say how they don’t like to be alone but many are curious about what it is and what I will be doing while there. Seclusion is a time to be completely alone to pray, chant, meditate, journal, contemplate, read scripture or other inspirational books, commune with nature, be silent, do yoga postures, or practice deeply any spiritual practices you may have. The rewards for taking out this time for God alone comes back in rewards throughout the year. There is no particular formula for seclusion, and people generally find what works for them. As a wife and mother of two young children, my seclusions started out as two nights over the weekend and slowly increased until I was able to get away for a week (the recommended time per year to take for this practice). I always go at the same time every year which helps not only ensure I get the time on my calendar, but prepares my family to the rhythm of my departure. When I lived in Oregon, I would rent a cabin at the various state and national parks. Here in California there are wonderful parks as well as meditation centers and retreats to stay at that focus on offering you quiet time. 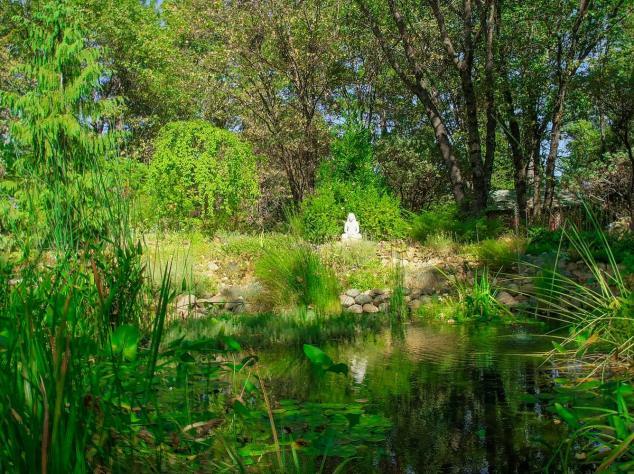 This last time I stayed at Ananda Meditation Retreat in Nevada City. For those unfamiliar with secluding, they occasionally offer guided seclusions. They also offer a variety of housing options from pitching your own tent to private dome houses complete with kitchen and bath. Meals are available in their dining room and their grounds have a Temple as well as a meditation garden with different shrines to many different faiths. They even provide nice little tags that say “Please Excuse me. I’m in Silence” so people know to let you be in you space. So, what do I do in seclusion? I arrive at my destination, get myself unpacked and my altar set up. Check in is always mid-late afternoon so I will often do some yoga postures before meditating, write in my journal, and head to bed for the night. One thing that invariably happens is that the body realizes you are away to rest and recuperate so there is usually a period of immense sleep, either a long night the first night, or a nap in the afternoon on the first day or two in seclusion. At first I felt guilty about sleeping when I was supposed to be communing with God, but spiritual practices takes a lot of focused energy and I have learned to allow myself the needed time. I do away with alarm clocks and let my body rise when it will, this last seclusion between 3:30 am – 4:30 am. If I had a dream, I’d write it in my dream journal, drink some water, energize (exercises created to help one learn to feel and control the energy in their body), and meditate. With no time schedule, my meditations can last for as many hours as I can do with dynamic focused energy. After meditation, I’d journal, shower, eat if hungry, and either read something inspirational or about something that I want to focus deeply on while in seclusion. Next might be a walk communing with God in nature and time out in the sun, then more meditation. When my body can’t seem to sit anymore, I’ll do yoga postures, another walk, or stretch out and listen to an inspirational talk. The rest of my days are some variation of the same, going deeper into spirit with devotion flowing through every ounce of my being. Many hit a wall on the third or fourth day wondering if they will make it a week but once past the doubt, the rest of the week flies by. I usually eat very little, living off of Divine Energy. I may eat fruit, green smoothies with raw goats milk yogurt, or have some soup or a small salad. I always get cold from the withdrawal of energy from the outer edges of my body into my spine or chakras so warm tea with raw honey is always a must for me. After seclusion is over there is what is called “re-entry”. It is that period of coming from silence and complete immersion in God and your spiritual practices back to your responsibilities at home and work. The first words spoken after a week of silence are very diferent, like an observer watching someone else speak. Your words are usually few, chosen well, and of a quiet and sweet nature. You prefer the peace from which you’ve just come from to loud environments with lots of activity. If you’ve been fasting or eating lightly, then heavy processed food has lost some of its appeal and you’d rather sustain from food or eat something nurturing and light. I usually text or call my husband and let them know when I am on my way home. I take time during the drive to mentally prepare myself for all the hustle and bustle of family life. When I return, I am a better wife and mother. I have infinite patience, love, and gratitude for the blessings in my life. I use this opportunity to make changes that would help me in my daily efforts to commune with God and be of better service to my family and humanity. The beautiful memories and deep experiences from my time in seclusion stay with me always, a constant reminder that we are children of the Divine, deeply loved and forever blessed. This entry was posted in Meditation and tagged Ananda Meditation Retreat, meditation, seclusion. Bookmark the permalink.